Get your event off to a real bang with Clay pigeon shooting. This activity is available for almost everyone from the novice to the experienced shooter. Expert tuition will ensure that you are trained using the right size shotgun and are given all the techniques you will need to strike your first clay disc! 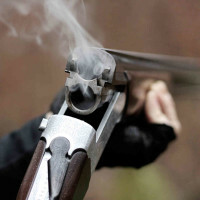 Clay pigeon shooting experiences and courses are thrilling and exhilarating events and with a little practice you will be popping clays from the sky one after another. Clay shooting is available throughout the UK and typically runs as a 2-3 hour session, with 14-30 clays the most popular options. Just let us know where and when you want to go with your group and we will get some ideas and suggestions right away.